The above quote by Muhammad Yunus, the Nobel Peace prize winner, and social entrepreneur sums up the power of technology which majority of people have recognized already. In a bid to create a smarter world, multiple companies have emerged, and many are planning to step into the technological world. Breakthroughs have proved beyond any doubt that what used to seem fictional can soon become a reality. However, many companies are found to engage in activities that have raised eyebrows across the globe. No wonder, such companies are now facing the heat to bend themselves to accommodate the country laws where they have their business operations. The above words spoken by India’s IT and Law Minister Ravi Shankar Prasad is a clear message to the tech giant that it has to accommodate some laws, willingly or unwillingly. The tech giant has entangled itself in legal complexities due to the debacle of the data breach of nearly 87 million people across the world. The Facebook fiasco had come to light in mid-March 2018. Speculations are high that data breach by the social networking site had affected the U.S. electoral process. With each passing day, the sheer magnitude of the data breach is stunning Facebook users in multiple ways. The data breach has severely affected the sanctity of the electoral process. None of the nations are now in a mood to let the tech company play with the data of its citizens in the name of offering them a platform to connect with each other. The Federation of German Consumer Organizations has already made a move and sued the tech company as it has observed that Facebook’s default settings have blatantly violated the need for explicit consent from users. Facebook CEO Mark Zuckerberg has testified before the Senate in U.S.A over the privacy scandal issue. However, the response of the European Union is sterner. It has formulated the European Union General Data Protection Regulation (GDPR) law that has come into effect from May 25, 2018, and Facebook has to comply with the privacy law under all circumstances. Now, let’s move on to the next tech company which is Taobao.com, a subsidiary of Alibaba Group. Headquartered in China, the online shopping company engaged in C2C and e-commerce business has come under the scanner of the Chinese authorities. The authorities have already issued a stern warning to the tech company that allows its users to bypass the state censorship. The platform allows several vendors to sell tools that eventually aid shoppers to set up illegal VPN’s. The online platform with its headquarters in San Francisco has grown by leaps and bounds in the past few years as an accommodation provider. The company that does not own any real-estate property connects homeowners with people seeking comfortable accommodation. San Francisco residents have alleged that the company has fueled a trend of renting rooms for long-term period at attractive rates which act as an incentive to push out their existing tenants. Out of 8000 Airbnb listings in the city, only 2100 had registered with the city authorities which means many people are renting out their homes illegally. However, the tech company has to, at last, adhere to a new law of San Francisco that comes into effect on January 16, 2018. 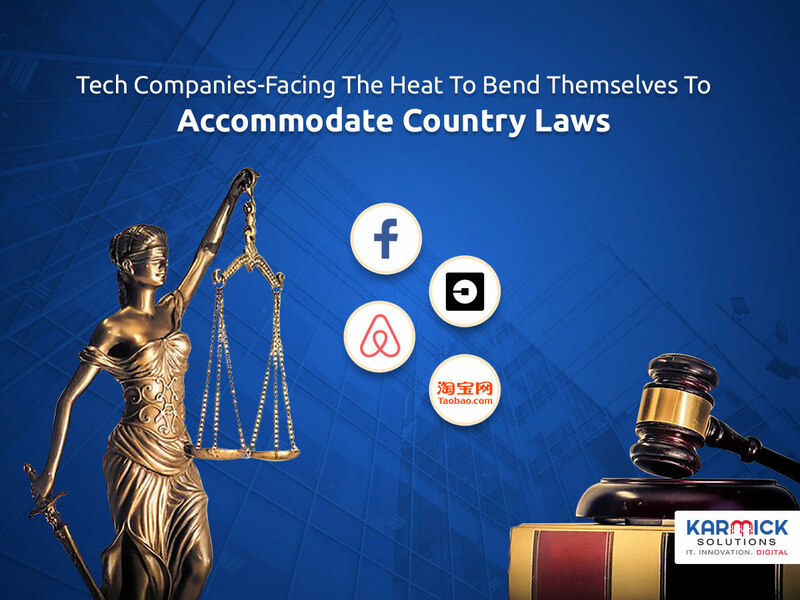 As per law, the tech company has to remove the listings of those who are willing to rent out their residential spaces for a short-term if they don’t register themselves with the city authorities and do not pay a mandatory fee of $250. Lastly, Uber Technologies Inc has its horns locked with the governments of multiple nations such as France, Germany, South Korea, Hong-Kong, Japan, Indonesia, and Taiwan. While South Korean authorities have reportedly stated that Uber has violated their country’s transportation law, the ride-sharing company has to now adhere to the revised taxi regulations to operate within the country. In many of these countries, a failure to comply with the country laws has led to suspended or limitation of its services. Tech companies have now become aware that no longer they can bypass the country laws if they want to expand their business. The key lies in revisiting the overall business strategy.